This trip takes you out on a spectacular cruise to look for humpback and killer whales. 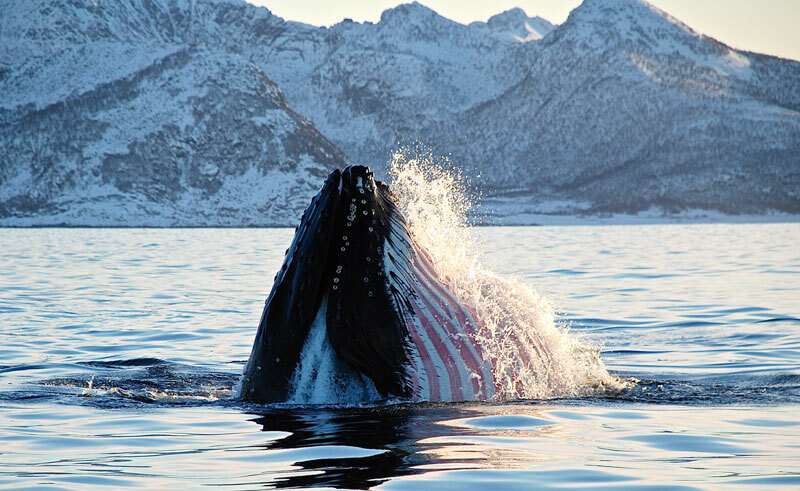 Depending on the whales location the journey can either take you out on the open Norwegian sea or closer to the Tromso fjord area. The large catamaran has comfortable seating for up to 146 guests as well as spacious decks on two levels for excellent viewing and photo opportunities to try and spot the whales. With a cruising speed of 20 knots, it reduces the travelling time from the port to the whales and extends the whale watching duration. You might also spot sea eagles and seals on your journey! The knowledgable guide provides information about the safety rules, a presentation and film about the whales and surroundings you will see during the trip. While there is never the guarantee of seeing whales, statistics show the winter season to be a good period for sightings. Included in the tour is an English speaking guide, all weather suits (limited in numbers), hot drinks and biscuits. There is a kiosk on-board to purchase hot meals, snacks and cold drinks. Remember to bring your binoculars and cameras! Note: As you know nature can be very unpredictable. At the moment the whales are located further north near Skjervoy and are not in great numbers in the Tromso area. The catamaran can travel to this area but the journey time is approximately 2.5 hours each way. Once there you still have the Whale safari, but the overall excursion time will be about 7 hours in total, returning back to Tromso at 4pm.